Kathryn A. Besig Close, 98; of Fulton died Thursday, December 29th at St. Luke Health Services, Oswego. 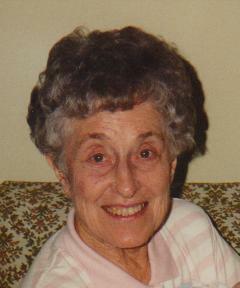 She was born on August 16, 1913 to the late Catherine (Kennedy) and George Besig of Whitesboro, NY. She married Joseph Close and moved to Fulton, NY where they lived in the town of Granby for over 50 years. Kathryn graduated from Whitesboro schools and was a 1935 graduate of Oswego Normal School. She taught in Oriskany, NY and then in a one-room school at Ira Hill, NY. Mrs. Close worked for the Fulton School system as a kindergarten teacher for many years retiring in 1975. Many of those years were spent at the Erie St. School, Fulton. Kathryn loved little children and spent much of her life educating them. She was a former communicant of Holy Family Church, and St. Michael’s Church, Fulton. Mrs. Close was a member of the CSEA, and past member of the Fulton Retired Teacher’s Group. She was pre-deceased by her husband Joseph Close. Kathryn is survived by her and Joseph’s 4 children: Judith (William) Manfull of Mt. Dora, FL, Margaret (Stephen) Young of Fulton, Michael (Janeth) Close of Aiken, SC, and Timothy Close of Fulton; her sister Mary Weber and sister-in-law Mary Besig; six treasured grandchildren: Vicki Hohman, Lynne Cerniglia, Wendy Manfull, Michael Close, Amy Sessler, Melissa Manfull; five beloved great grandchildren: Joseph, Jacob, Katherine, Erin and Samuel, and several nieces and nephews. Funeral Services will be conducted privately at Holy Trinity Church where a mass of Christian Burial will be celebrated by Rev. Stephen Wirkes. Burial will be held privately in St. Mary’s Cemetery, Fulton. Calling hours will be conducted privately at the Sugar Funeral Home, Inc., 224 W. 2nd St. S. Fulton, NY. The family would like to thank the wonderful staff of the A-Wing at St. Luke Health Services for the loving care they gave Kathryn. My sympathies to Mrs. Close’s family. She was my Kindergarten teacher and was a very lovely caring person. She was my kindergarten teacher at Erie Street School and was always so very kind. I will always remember her with much fondness. Who could ever forget Mrs. Close? She was my kindergarten teacher in the mid 60’s. We even used to go back to see her after we “graduated!”. Rest in Peace Mrs. Close. I had never forgotton my 1958 kidnergarten teacher, Mrs. Close. It was such a long time ago – I still have a photograhic memory of Mrs. Close playing the piano with the class singing along with her, ‘This Old Man” and other children songs. My deepest condolences go out to the Close family. She was also my kindergarten teacher…I was just talking about her the other day…I will never forget her..
Mrs Close was my kindegarten teacher too and a great teacher she was. Mrs. Close was my Kindergarten teacher in 1972. She was loved by all and surely missed..